Do you like to explore large cities in a video game? Perhaps you play a lot of the most famous city based game called Grand Theft Auto. These games are famous for having huge sprawling cities that you can explore at your leisure. If you like the latest version of Grand Theft Auto, you will certainly enjoy this map. This is the Grand Theft Auto Los Santos Map for Minecraft! Grand Theft Auto 5 has a ton of space in its open world, from cities, rural areas, beaches and much more. This map aims to recreate a lot of the map in the game. 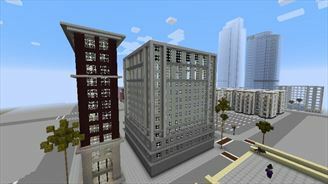 You will find skyscrapers, parks, roadways and so much more!